Uniting Davy Tullochâ€™s Shetland Reels and Veronique Nelsonâ€™s Wessex airs â€“ with their differing techniques and oral traditions â€“ provide dynamic two-part fiddle playing which combines with the jazzy ensembles of Dave Jacksonâ€™s guitar to create an exciting and original new sound. 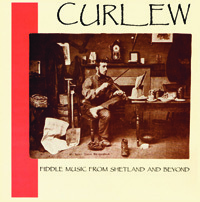 Curlewâ€™s two fiddles adapt dance rhythms and songs, many from Shetland, Scandinavia and Galicia, with guitar and occasional string bass accompaniment. In some pieces a two-part invention or rhythmic counterpart is clearly discernible, making for an invigorating and distinctive style.